HONG KONG (Reuters) - Hong Kong has barred a Financial Times journalist from entering the city as a visitor, after authorities refused to renew his work visa in October, in a move a British official said undermined free speech. Asia news editor Victor Mallet "attempted to enter Hong Kong on Thursday as a visitor but was turned away at the border after several hours of questioning by immigration officers", the Financial Times said. Mallet did not comment further when contacted by Reuters. Hong Kong's government said the case had nothing to do with freedom of expression or the media, and that it was "acting in accordance with the law and the prevailing immigration policy to make a decision".Analysts have cited the FT editor's case as the latest of a series in which Hong Kong officials have taken a tough line on dissent in the former British colony. Mark Field, British Minister of State for Asia and the Pacific, now visiting Hong Kong, said the visa denial "undermines freedom of speech and freedom of the press". 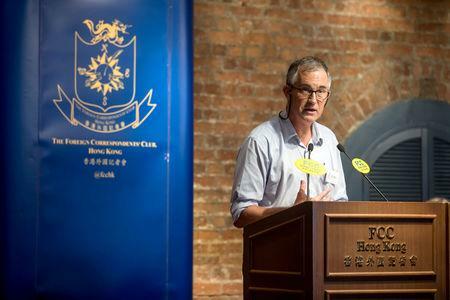 Authorities declined to renew Mallet's work visa last month after a speech he hosted at the Hong Kong Foreign Correspondents' Club by an independence activist was strongly condemned by officials in China and Hong Kong. They gave no reason for the visa denial. Beijing has said any advocacy of independence will not be tolerated in Hong Kong, which it considers an inalienable part of China. The city was returned from British to Chinese rule in 1997. Hong Kong's mini-constitution guarantees Hong Kong a high degree of autonomy not allowed in mainland China, as well as the "freedom of speech, of the press and of publication". But critics point to recent incidents including the barring of young activists from elections, disqualifications of pro-democracy lawmakers and mainland-style tactics to smother dissent. Joshua Rosenzweig, East Asia Research Director for Amnesty International, tweeted that the effective blacklisting of Mallet would have a "chilling effect on freedom of expression". Chinese dissident writer Ma Jian has struggled in recent days to find a venue for two talks he plans to give as part of the Hong Kong International Literary Festival. Ma, who lives in Britain, was told by the Tai Kwun arts centre, which was set up with government support, that his events would no longer be hosted. 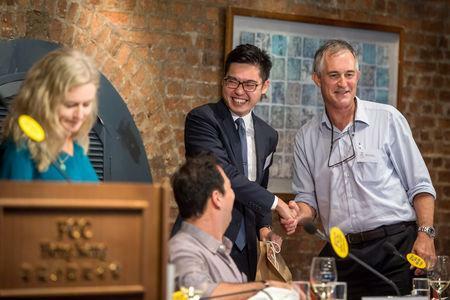 Tai Kwun's director Timothy Calnin said in a statement it "did not want to become a platform to promote the political interests of any individual". But in an about-turn after Ma arrived in Hong Kong from London on Friday, the arts centre said his events would go ahead as planned and apologised for the confusion. "We have reconsidered our position in light of the possibility that these events might be prevented from taking place altogether. With this in mind, Tai Kwun has made its venues available to the Festival for Mr Ma’s two appearances," it said in a statement. Ma said he had been unable to find a Hong Kong publisher for his darkly satirical new novel, whose title echoes one of Chinese President Xi Jinping's slogans. "I'm a novelist, not an activist, and am attending the Festival to discuss my new novel, China Dream. My 'politics' are simple: I believe in free thought and free speech. Without them, life has no meaning," Ma wrote on Twitter.